A few days ago I had some guests and one of them was having her birthday in a few days. She would be turning 85 so I wanted to do something special for her so I made this creative and wonderful cake with white chocolate and cream cheese frosting, which I decorated with cherry preserve and pasteli. I wanted to surprise her with a Birthday Cake, so a few days before, I visited a few confectionery shops in Nafplion to order a cake for her. Unfortunately, what I saw was quite disappointing as I did not like what I saw and as I know that these cakes only use a little sponge in the cake and most of it is mostly pudding and lots of whipped cream, I passed. The decoration was very simple with nothing impressive, so it was not worth the while, having to go back to Nafplion to get the cake the day before they arrived. That’s when I decided I would make one myself. I’ve always admired small, high cakes, as they look so good when they are cut. I’ve been planning for ages to buy two small baking tins, so I decided it was about time to go ahead and buy them. I bought two small ones, of 17 – 18 cm (7 inch) diametre each. The dose of my sponge cake fitted perfectly, divided in both. I cut each sponge in the middle and wet each piece with cherry syrup and cherry liqueur. I then made the whipped cream and melted some white chocolate which I combined with cream cheese to make the frosting, in which I added some lemon essence. 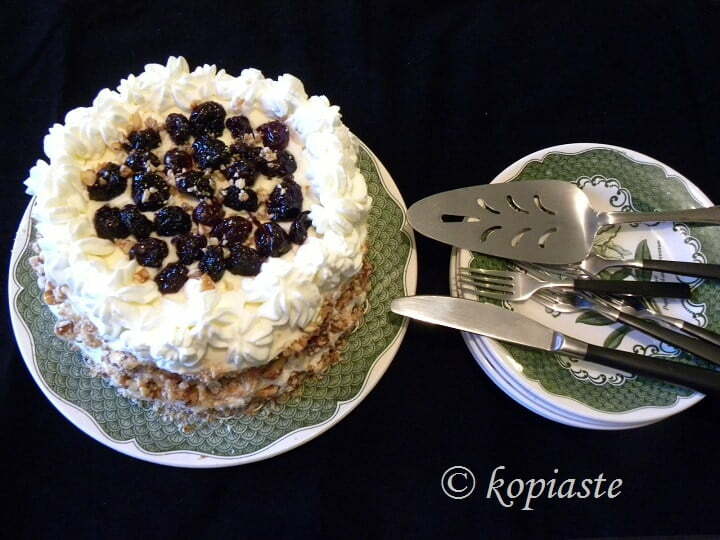 I used the remaining whipped cream to decorate the cake, as well as home made cherry preserve and a unique Greek product, called pastelli. When I went to the supermarket to buy the ingredients I needed for the cake, I was looking for something to use as decoration but the only things available were sprinkles in various colours, chocolate shavings, candied fruit, nuts, chocolates etc. I did not want to use any of these, as I’ve already used them in the past. While I was looking around for something to use as decoration, I saw some pastelli on the shelves and the idea of using it flashed into my mind. I could visualize how this crunchy treat, with the taste of caramel and roasted nuts would be on the cake and I salivated. I knew that this would be a great hit so I decided to make pastelli myself. I’ve made some in the past but as it’s published in my cookbook I’ve never posted it on my blog. The new recipe will be posted in a separate post some time in the near future. This amazing Greek product is really neglected in Greek recipes and it’s about time it finds a place in Greek Gastronomy. I’ve used it in the past to make cookies and will be using it again in future recipes as it’s an amazing product. In the meantime, until I post the recipe for pastelli, if you make the cake you will have to look for it in shops selling Greek products or on Amazon. However, don’t buy the one which is only with sesame seeds and honey, as it is too soft and won’t work. The recipe may look complicated but it’s not that difficult to make it and if you are new to baking you can always use ready made sponge. However, it’s worth all the effort as the result is amazing and one of the best cakes I’ve made until now. Prepare the sponge cakes from the previous day. Prepare the whipped cream. Whip the heavy cream with 2 heaped tsp icing sugar and 2 drops of lemon essence until peaks form. Refrigerate until ready to use. Prepare the White Chocolate, Cream Cheese frosting: Melt the chocolate over a water bath (bain mari). Set aside until it cools. Using a hand mixer or a whisk, beat the butter and cream cheese until smooth. Add the whipped cream, lemon essence and icing sugar gradually and mix on low to medium speed. Finally add the cold or lukewarm melted chocolate and mix to incorporate. Refrigerate until ready to use. Pound the pastelli, using a pestle and mortar to make coarse pieces (or place between cling film and use a heavy object, such as a mullet or a bottle). Drain the cherry preserve over a bowl to collect the syrup. When it drains mix in the cherry liqueur. Cut the two sponges in the middle so that you have four pieces. Wet them with the syrup-liqueur. Place the first sponge in a plate and add some frosting. Continue with the remaining three pieces but making sure there is enough frosting to frost the cake on top. Before adding the frosting on top, wrap the sides of the cake in cling film and refrigerate for an hour until it sets. Remove the cling film and add the remaining frosting on top and the sides. (If the frosting becomes thick by that time, just heat it over again using the same method until it becomes runny again). Glaze the cake by pouring it on top and let it fall to the sides so that it is smooth on top. Use a knife to put the frosting on the sides. Refrigerate for a while until it sets. Add the whipped cream on the sides and put the remaining in a piping bag to make rosettes or other decoration. Add the larger pieces of pastelli one by one, on the sides and sprinkle the remaining to cover the gapes. Garnish with the cherry preserves. Refrigerate until ready to serve. Can hold up to a week in the refrigerator. What a lovely cake, Ivy! And what a lovely gesture! Thank you Preeti. Same to you! What a beautiful layered cake! I love those crunchy pastelli slices as well. So fluffy and delicious looking! Hey.,What a lovely cake, Ivy! And what a lovely gesture!